23 pairs of chromosomes. One unique you. Experience your ancestry in a whole new way. Enter your email address to unlock $30 OFF Health + Ancestry Service Mother's Day Offer. *Entry of your email address is not necessary to redeem the offer. I consent to the transfer and validation of my email address in conjunction with this email service. I understand that I may withdraw my consent and unsubscribe at any time. Discover what 125+ personalized reports have to say about your ancestry, health, traits and more. Meet your genes with 125+ personalized reports on health, ancestry and more. Get an even more comprehensive understanding of your genetics. Receive 125+ online reports on your ancestry, traits and health - and more. What can your DNA say about your health? 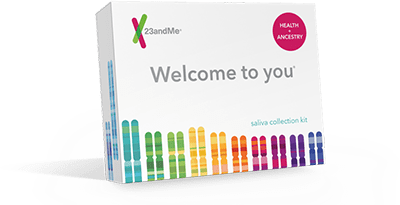 Learn more about your health, traits and ancestry, with a package of 125+ reports that only the 23andMe service offers. You are made of cells. And the cells in your body have 23 pairs of chromosomes. Your chromosomes are made of DNA, which can tell you a lot about you. Explore your 23 pairs today. Find out what your 23 pairs of chromosomes can tell you. Your DNA analysis is performed in US laboratories that are certified to meet CLIA standards—the Clinical Laboratory Improvement Amendments of 1988. A CLIA-certified lab must meet certain quality standards, including qualifications for individuals who perform the test and other standards that ensure the accuracy and reliability of results. We use leading technology to genotype your DNA—a custom version of the lllumina Global Screening Array. Provide your saliva sample from home. Mail it back to our lab in the same kit it came in—the postage is pre-paid. We bring your genetics to you. We have more than five million genotyped customers around the world. In 2015, 23andMe was granted authorization by the US Food and Drug Administration (FDA) to market the first direct-to-consumer genetic test. If you have the Health + Ancestry Service you have access to the full 23andMe experience. If you only have the Ancestry Service, you can easily upgrade to the Health + Ancestry Service for $125 which gives you access to all 125+ reports on ancestry, traits and health. You are eligible to upgrade once you have received your Ancestry reports. To upgrade, log in to your 23andMe account and navigate to the Settings page. You will receive immediate access to your new health reports. How accurate are the reports? You choose how your genetic information is used and shared with others. We tell you how those choices are implemented and how we collect, use and disclose your information. The Amish are a group of people residing mainly in the central regions of the United States. Descended from Swiss and German ancestors, the group is defined by religious and cultural practices, including strong church membership and limits on the use of technology. Those who trace their roots to Jewish settlers in Central and Eastern Europe during the Middle Ages. North African Berbers are people of mixed Arab and Berber origin. They live in communities across the North African Maghreb region, which includes the countries of Tunisia, Morocco, Algeria, and Libya. Find and connect with relatives in the 23andMe database who share DNA with you. Learn the origins of your maternal and paternal ancestors and where they lived thousands of years ago. Women can only trace their paternal haplogroup by connecting to a male relative - such as a father, brother, or paternal male cousin. This is because the paternal haplogroup is traced through the Y chromosome, which women do not inherit. 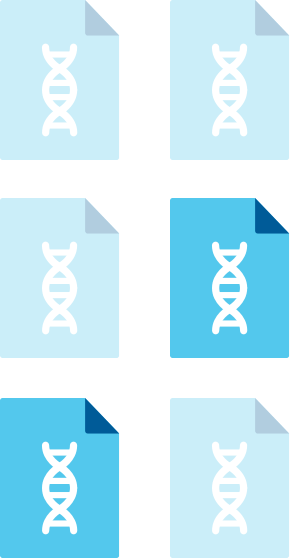 Reports and features that are "Powered by 23andMe Research" are developed by 23andMe scientists using data and insights gathered from thousands of customers who have consented to participate in our research. People with Sephardic (or Sephardi) Jewish ancestry can trace their roots back to Jews who settled in Spain and Portugal.